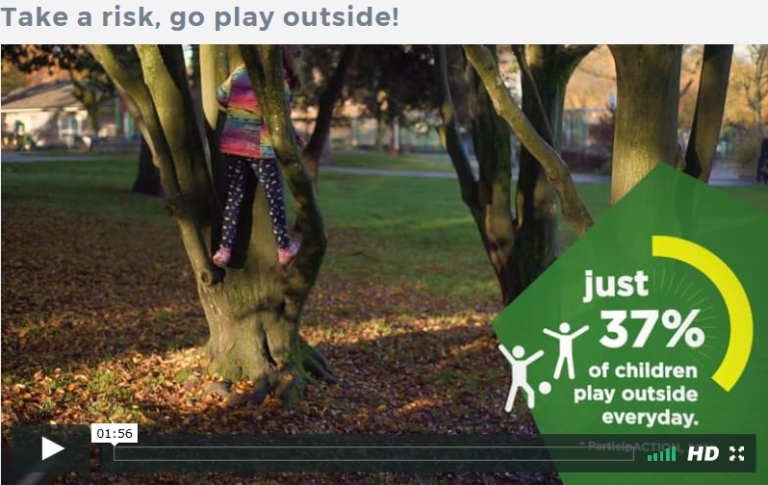 The University of British Columbia, BC Children’s Hospital, and the BC Injury Research and Prevention Unit have created the Outsideplay.ca app to help parents, caregivers and community stakeholders encourage children to play outside and take risks in play. The goal of the app is to help parents, caregivers and stakeholders manage their fears, find a more balanced approach to risky play and give them the confidence they need to allow children to explore and experience their environment safely. 1Outsideplay.ca Frequently Asked Questions. https://outsideplay.ca/#/faq -accessed July 31, 2017. 2Outdoor learning in the early years. The benefits of outdoor learning and outdoor activities for children. Outdoor risky play for all. https://earlyyearsoutdooreducation.wordpress.com/outdoor-risky-play-for-all/ -accessed July 31, 2017. On Outsideplay.ca there is a journey map with a series of questions/scenarios where parents and caregivers reflect on their past experience playing outside and taking risks, examine concerns they might have and create an action plan for parents and caregivers. There are also FAQs that describe the importance of risky play, common concerns such as safety and fear of abduction, dealing with criticism from other parents and ideas to get started. To start your risky play journey click here.